The first memory I have of being on African soil was my South African Airways plane touching down in Johannesburg, South Africa. I excitedly peaked through the window and caught a glimpse of Black tarmac workers offloading luggage. I distinctly remember locking eyes with one who even waved at me. The other passengers weren’t de-planing fast enough. I just wanted to get off of that plane and be enveloped in the South African outdoors. To smell it. To feel it. To study the faces of these familiar but long lost cousins. I was finally in the Motherland, the continent of my African ancestors. History says most African American’s ancestors were captured from the shores of west Africa. What corner of the continent I was in was of no consequence to me. I was just elated to finally be ‘home’. My assignment was a year abroad as an English teacher in neighboring Namibia. A two hour connecting flight from South Africa landed me into Namibia, ‘the land of the brave’. I had done some research. Seen a few photos of Namibia’s famed Himba tribe. I admittedly arrived with a stereotypical vision of what Namibia would look like. I envisioned lush greenery and tropical plants. The west African terrain I’ve always imagined my own ancestors’ communities to resemble. But Namibia looked and felt different. The night air felt crisp and dry. The next morning I awoke to backdrop of tan mountain ranges and flat savannas. After three weeks of orientation, I arrived at a high school in the country’s northern Omusati region. My students were extraordinarily friendly and fascinated by the new ‘Black American’ teacher. I received a slew of curious stares. Some of the more bold students approached me with twinkles in their eyes. They asked me about artists like Chris Brown and Beyonce. I could tell that their perception of me had been shaped by American hip-hop and popular culture. It was almost as if knowing me made them feel a bit closer to their favorite African American rappers and singers. My professional colleagues at the school were initially reserved towards me. I had expected a warmer welcoming, but after polite greetings they kept their distance. Getting to know a new face takes time, however this was a bit more chilled than I anticipated. My black American-ness seemed to have caught them off guard. I was an anomaly – the first African American volunteer teacher at the school. One teacher told me she didn’t know there were black people ‘from there’. As I reminded them of the slave trade I realized that most of them hadn’t really made the connection between myself and my African ancestry. American slavery wasn’t heavily emphasized in the Namibian educational system. There was a day I allowed some students to braid my hair into a local style called a ‘fishtail’. My colleagues reacted to my new do with a mixture of surprise and adulation. They were taken aback at how easily I could physically blend into their society. My African ancestry was really beginning to show. Slowly my colleagues began to open up to me and I started to feel more ‘in’. There were more often than not times when my American-ness superseded my Blackness. When Osama Bin Laden and Muammar Gaddafi were killed I fielded questions from my colleagues about my government. I listened. I observed. It was eye-opening to witness just how much American foreign policy has soured their opinions of America. Midway into the school year two new female teachers around my age joined the school’s staff. They formed a close trio with a third teacher who was already there. I imagined the four of us being relatively close. Yet an invisible wall developed between them and myself. I felt I had been nothing but friendly. I was about their age. I was black like them. Why wasn’t I being welcoming into their clique? It was the first experience to truly color my perception of life as an African American in Africa. There was no guarantee that I would be accepted or welcomed by certain Namibians just for being Black. I chalked the surprising yet disappointing situation up to the centuries of separation within the African diaspora. We simply do not know each other. It is a basic unfamiliarity that too often leads to assumptions and false interpretations about the other. I felt stereotyped about what I was perceived to have materialistically. My level of English also seemed to feed into a certain silent competition. 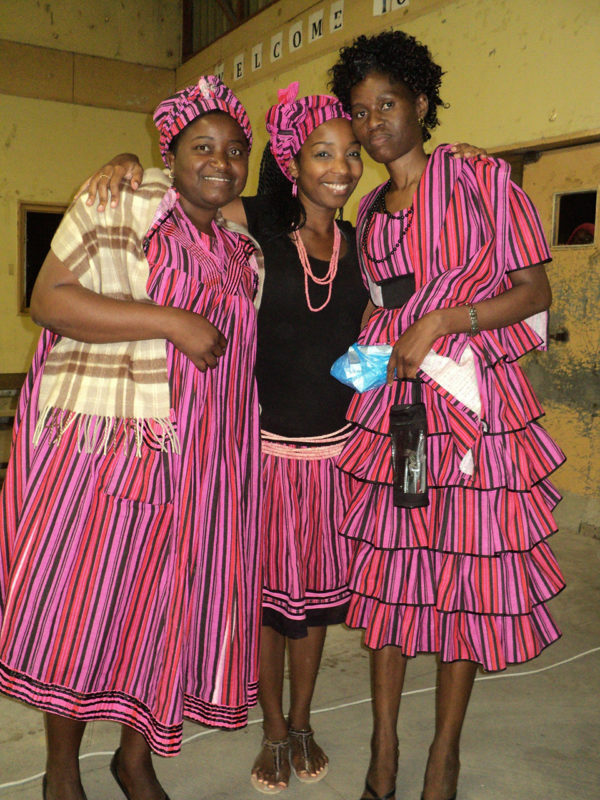 What they didn’t know was that I had moved to Namibia yearning for sisterhood. I didn’t think I was better than them. I was here with no superiority complex. In fact, I envied the rich culture they still had and the close knit nature of their tribe. Six years later I am still living in Namibia. Married and with a young child. Personally, socially, and sometimes professionally, my life here has been no utopia. It is a continual learning curve. Something tells me the challenges have been necessary. They’ve tampered down the naive expectations of perfection that I had upon arriving here as an African American. I now see a much clearer reality of what it is to live in Africa as an African American. And despite these challenges there are still many similarities between Namibian culture and my own. The barber shops and braiding salons. The outdoor chit chatting that reminds me so much of Black communities in the American summer. As an African American in Namibia, I’ve found myself on a median, one foot in, one foot out, always yearning for the homecoming of an ancestor I may never find. Is this the first woman to ever surf the long barrels of Namibia’s Skeleton Bay?